IRISNDT carries out PMI using the latest Niton and XMET portable analysers throughout Europe, IRISNDT also employs full time metallurgists and has a mechanical testing facility and therefore can provide full analysis back-up. 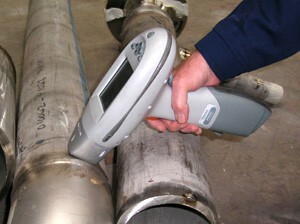 Positive Material Identification (PMI) is the analysis of a metallic alloy to establish composition by reading the quantities by percentage of its constituent elements (PMI) identifies all ferrous and nickel based alloys including stainless steels, Monels, Inconels, Hastelloys, aluminium alloy, alloys and exotic materials. Typical methods for PMI include X-ray fluorescence (XRF) and optical emission spectrometry (OES). PMI analysers are very portable leave no trace on the test piece and can be used on site to test any metallic components from small fittings, Bolts, stock items etc. to Pipework on power stations and Vessels on petrochemical sites.